As the most difficult days of training arrive (of course right as the days get shorter - and much much colder), I found this article on CollegeSwimming.com. It is a good read, and has some fine points. Definitely worth a post. Out here we're prepping for our next meet up north at the University of Maine - and it looks as though the team is in a good position to be very competitive. They have continued to work hard and learn. They have continued to achieve some impressive practice performances. I am looking forward to seeing what kind of progress has been made since the 21st, and I'll be sure to post a meet update asap! Tapering is associated with many physiological alterations that have a positive impact on swimming performance. In essence, you work very hard all season long, and get some extra rest leading up to your big meet. There are three variables that can be manipulated when tapering: frequency of sessions per week, intensity of each session, and the duration of the taper. If a swimmer doesn’t swim well at his or her big meet, 90% usually blame it on one thing: they missed their taper. I rarely hear these swimmers tell people they didn’t swim well because they took the summer off, they ate fast food all year long, they stayed up late every night, chose the slower send offs during practice, and didn’t push themselves like they should have in the weight room. I always laugh because there is a much greater chance that what they did the other 48-51 weeks of the year had a greater influence on if they swam well at the end of the season than the 1-4 weeks for which they tapered. Think about it. Most people taper for about 1-4 weeks, which is 1.9%-7.7% of the year. You don’t taper for 92.3%-98.1% of the year. So I wonder which part of the season has a greater effect on whether or not you swim fast at the end of the season. 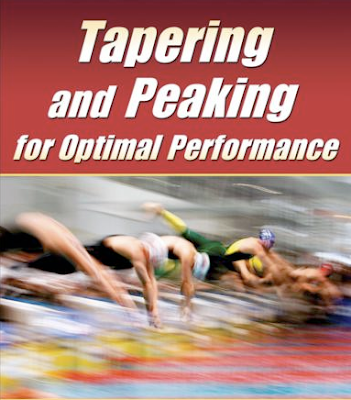 When swimmers have the meet of their lives, they usually say that they hit their taper. I love this line -- “hit my taper.” Sometimes, coaches taper a swimmer or their team perfectly, or so it seems. But I’d be willing to bet that the team put in the work all year long. If you didn’t put in the effort leading up to the taper, then you won’t have anything to taper off of. And you probably won’t swim as well as you expected. I’m not saying that the taper doesn’t have an influence on swimming fast -- because it certainly does. It just bothers me when swimmers immediately blame a bad taper meet on their taper and their taper alone. There are a myriad of things that go into swimming fast at your big meet at the end of the year. The taper is just one part. The right mindset during a taper is crucial. Some people have it; others, unfortunately, do not. Below are a couple of things that discuss one’s mindset and how they might affect a swimmer’s taper. 1. Some people “have” to be tapered in order to swim fast. If they aren’t rested, shaved, and suited up, they can’t swim fast—and they’ll tell you tell you this. Other swimmers are capable of swimming fast whenever they choose to partly because they have the mindset to do so. The people that don’t need to be rested, shaved, and suited to swim fast are the same people that perform in get-out-swims. Years ago, I heard that Ian Crocker went 19.7 in the 50 free in practice without warming up wearing just a legskin suit. The deal was if he went sub 20, practice was over for everyone. I read somewhere that Crocker said the only thing he needed to swim fast was a pool and a suit. That’s the attitude you need to have. 2. Some swimmers believe that they can only swim fast for one meet or for a meet that’s a couple days long. They don’t think they can “hold” their taper for very long. Again, to some degree, I think it’s about one’s mindset. I watched most of the World Cup meets held in Europe last month, and saw all the results. I noticed that swimmers were breaking records week after week. Many swimmers were actually getting faster as the series progressed. I think the top swimmers can do this because they have the mindset that they can and will swim faster week after week. 3. As long as you aren’t doing anything too crazy during a taper, chances are, it will work. If you’ve been working hard all year long, and have been swimming well in meets, you should swim faster at your taper meet. Some people do not. If you don’t think there’s something wrong physically, then the swimmer probably has issues mentally dealing with a big meet and/or a taper. Sometimes, just reassuring the swimmer that he or she has been practicing really well all season and that you (the coach) believe in his or her ability to swim fast is all you need to do. Other times, you might need to do some guided visualization with the swimmer. If the swimmer “freaks out” at big meets, then the best way to fix this is to put that swimmer in those situations throughout the year so he or she gets comfortable in uncomfortable situations. Swimming fast is just as much about having the right mindset as it is about actually being fast. If you believe you're going to swim fast, there's a very good chance you will. When taper time comes your way, remember to have confidence in what you've done all year.